Okay, all you students of La Bella Lingua, here’s your Italian lezione for the week: our Discover Ciociara project was written about in La Provincia, the newspaper of the provinces around Rome. The event covered here was the opening and dedication of the mural I’ve posted about previously, and about how our project is about art and friendship…actually that art IS friendship! 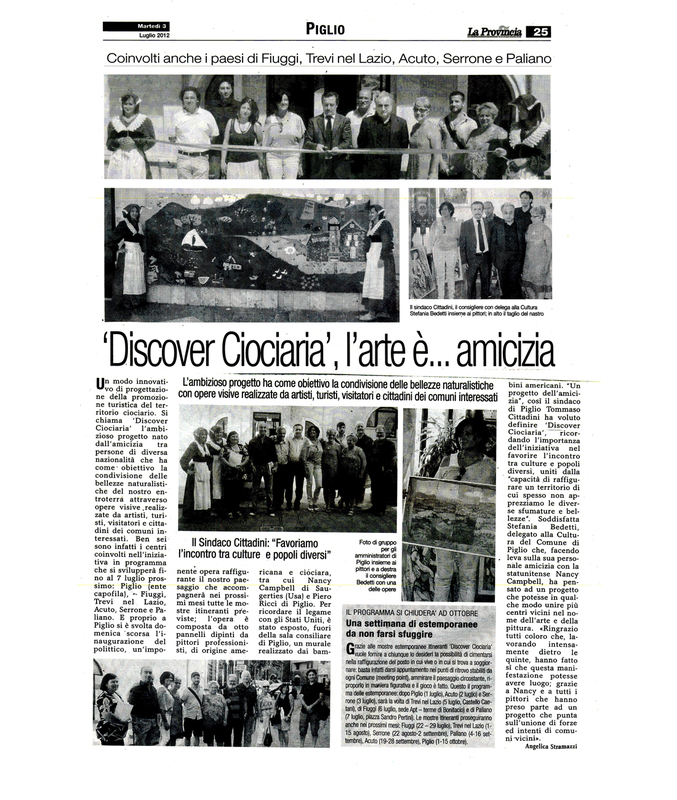 The mayor of Piglio is shown cutting the ribbon for the “unveiling” of Discover Ciociaria mural along with officials from other towns, and artists. Also shown is the mural done by Saugerties children several years ago of the Saugerties Lighthouse and Catskill Mountains. The mural of the Ciociaria landscape created by the four Italian artists and four American artists is now on exhibit in the lovely mountain town of Fiuggi, known for its healing waters. It is said that the artist Michelangelo was one of the first to tout the powers of the water to dissolve kidney stones! Pope Boniface made haste to get to Fiuggi, and the spa there now is named Fonte di Bonifacio VIII. Some 10,000 visitors a week take the “waters” during summer months. To learn more about Fiuggi visit http://www.comune.fiuggi.fr.it. Our mural is on display until July 29 at the Teatro Comunale. 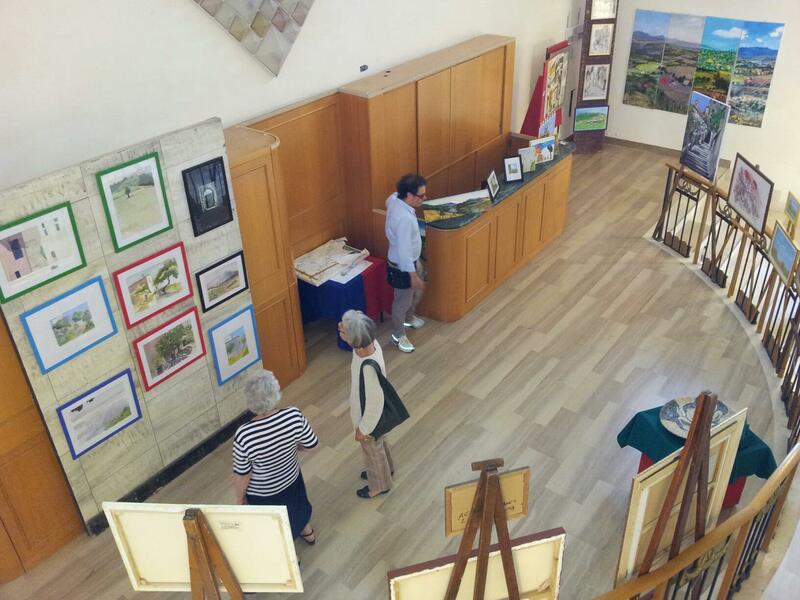 Here’s a photo of the display which also includes additional paintings created during our painting workshop by American painters of Discover Ciociara as well as many of our Itlalian colleagues who took part in simultaneous painting events during our stay in Italy. The creation of the flower carpet for l’infiorata took place on Saturday, June 30, to prepare for the sacred procession celebration of the Sacred Heart of Jesus on Sunday, July 1. The flowers are laid beginning at midnight, when the stone of the streets is relatively cool–to ensure that the flowers won’t immediately wilt! The procession featured scenes from the Bible, angels and saints, beginning at the beginning…Adam and Eve! Undoubtedly the most memorable of so many memorable moments during our time in Italy was our participation in the annual infiorata (literally, “flowered”) festival of the Sacred Heart of Jesus in the medieval town of Genazzano. Thanks to an invitation from one of the organizers (and “amore” of Giulio Tirinelli!) 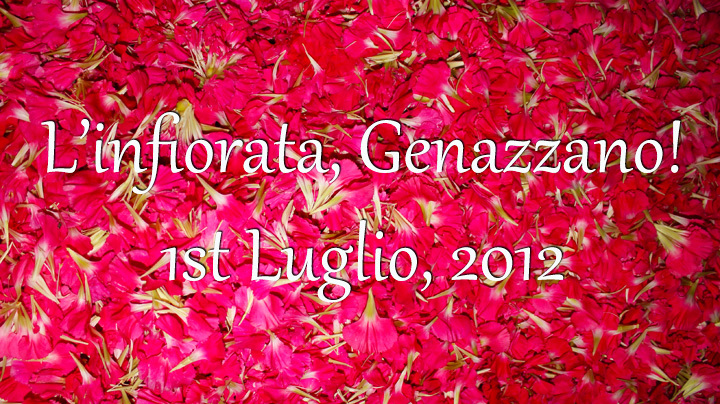 Cinzia di Fazio, our little group of artists got to create our own piece of history: this year Genazzano’s L’infiorata made the Guiness Book’s record for the longest flower carpet–1.642 kilometers, one mile! Here’s a peek at the “before”–where we met at midnight and worked until 3 a.m. on our design along with hundreds of the local people. Young, old, families, groups charged with the task of creating flower pictures with the most fragrant paint we’ve ever worked with! The seeds for the adult mural for Discover Ciociaria/Scoprire la Ciociaria were planted by the children of Saugerties, when, in 2004 or thereabouts, the Saugerties Lighthouse Conservancy, under the direction of its then president, Susannah Satten, took part in a national environmental art project called “Mural Miles.” Children from all over the U.S.A. were invited to create a mural which depicted the environment of their particular town. The murals were then displayed in a mile of murals, in California. Susannah and a group of kids from toddlers to pre-teens worked at my former gallery, The Half Moon Studio, to create a mural of Saugerties. The parents of the children of Piglio were so happy with the project that they suggested that they would love to make a mural of their own…which resulted in the 8 panel painting by four Italian artists and four American artists which I’ve already talked about here! 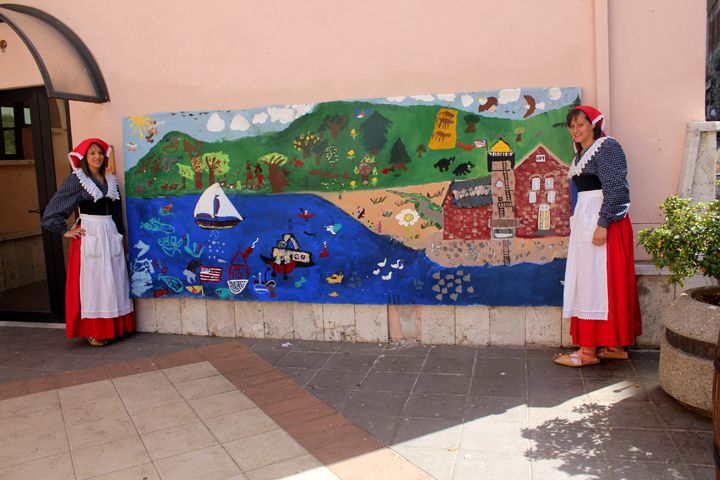 This year, we brought the Saugerties kids’ mural to Italy, where it will travel through December with its adult counterpart to the six towns taking part in Discover Ciociaria! 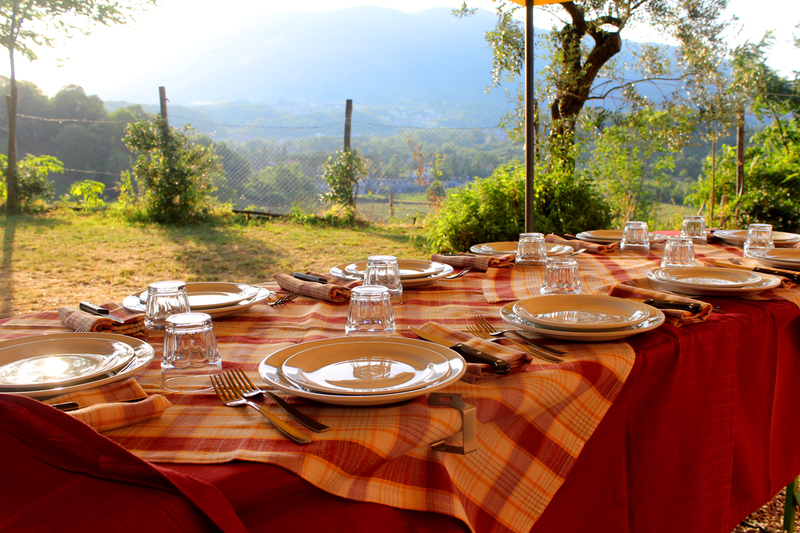 Our guests stay at La Sonnina, an organic farm near the village of Genazzano. Each morning there are farm fresh eggs for breakfast, for lunch or dinner, homemade pasta with organic veggies grown on site. A couple of donkeys hover near, with their little buddy, a small goat. Every once in a while the cows will sing with the black pigs providing the chorus! During this extremely hot weather we can always depend on a fresh breeze on the terrazza at La Sonnina. Our hosts are friendly and accommodating. 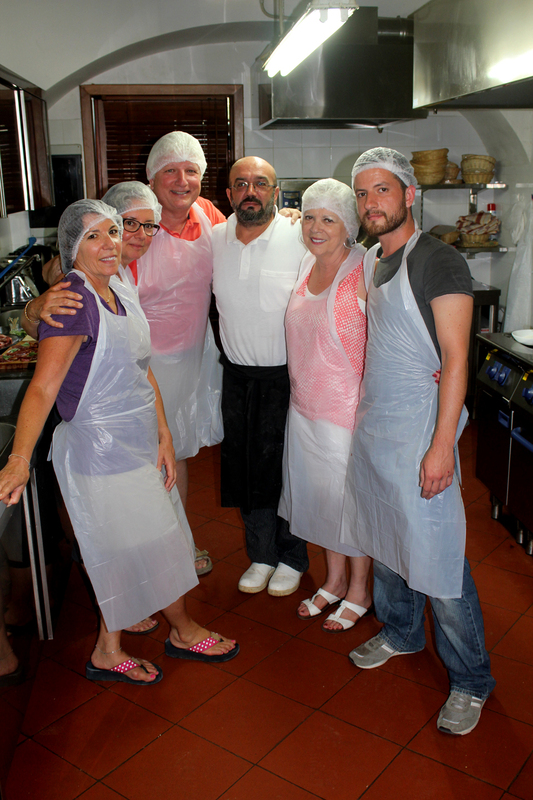 Here we are, below, happy graduates of the first La Sonnina cooking course, where we made Gnocchi al Sassetto and Saltimbocca alla Romana.